This is one of the most popular recipes that has ever come from the blog!! It is in my book Pure Delicious and its been quite a favorite among readers so I had to make you a video!!! Despite the fact that its still so warm out, we can’t even go outside and use the grill because of the wildfires which have covered our entire city in a blanket of ashes. I am not kidding, it is snowing ashes- and everything has a creepy green gray tint to it with a pink sun trying to creep through here and there. So with no grilling in the cards, I am happy to be pan-frying the bacon and chicken for this salad. OK- a quick story about how this delicious salad came to be. Several years ago when I stayed in New York for about 2 weeks after getting stuck there in a blizzard, I ate a version of this salad from room service at our hotel about 15 times. That means there were several times when I ate it for lunch and dinner. Like I was just obsessed with it. I had to recreate it here for you guys, and needed it to be just as full of color, texture and flavor. The is a great “filling enough for dinner” kind of salad that will leave you feeling satisfied and like you made a good choice. In a heavy skillet, cook the diced bacon over medium heat until it is crispy. Set aside. Salt the chicken thighs. 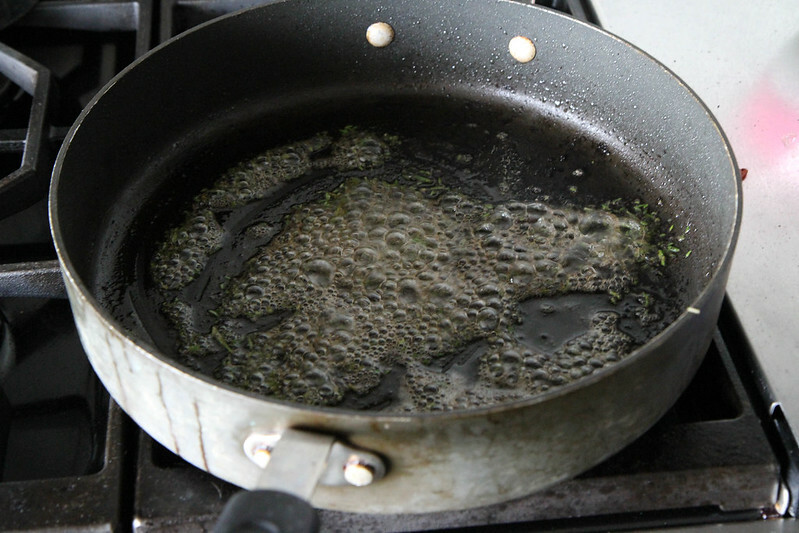 Add 1 tablespoon of olive oil and add the rosemary to the pan. 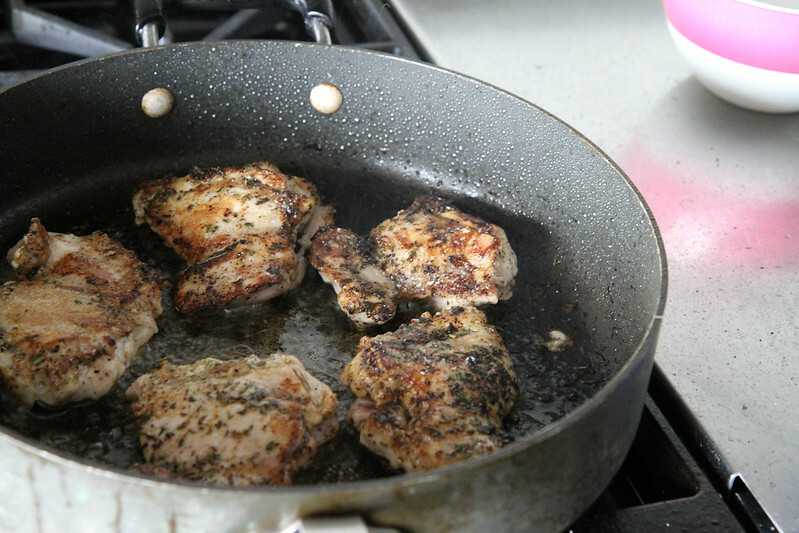 Add the chicken thighs to the pan. Cook the chicken thighs over medium-high heat until they were golden and crispy and cooked through, about 10 minutes. Meanwhile assemble the salad. Combine a bed of romaine and watercress in your bowl or on a platter. Top with cherry tomatoes, red onion and crispy bacon. Slice the avocado, sprinkle the avocado with kosher salt. And pile them on the salad. 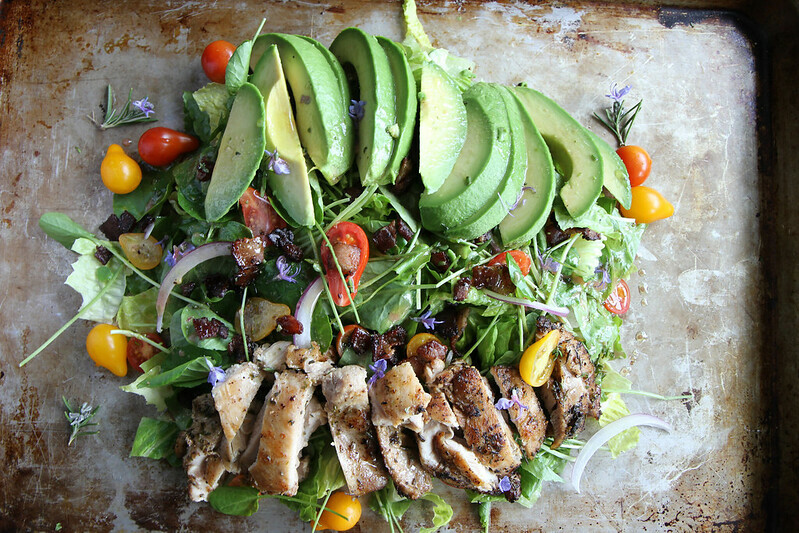 Slice the chicken and pile that on the salad. 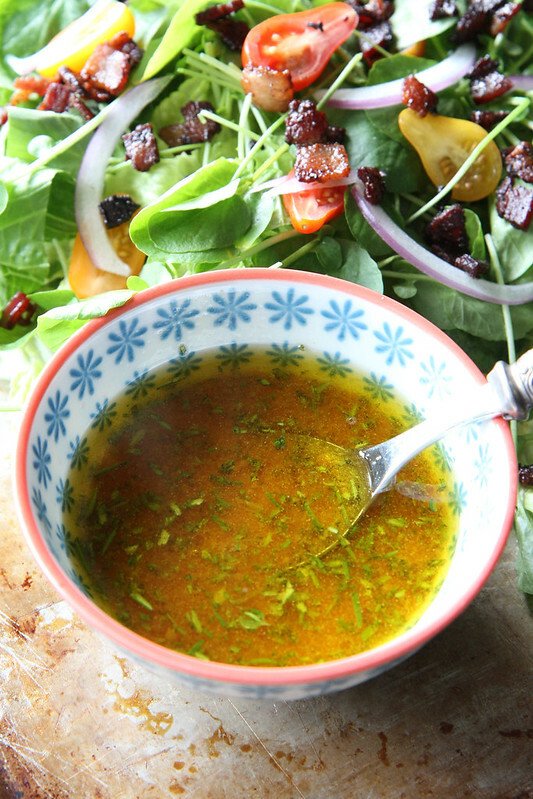 Make the vinaigrette by whisking together the rosemary vinaigrette ingredients and seasoning to taste with kosher salt. Make the vinaigrette by whisking together the rosemary vinaigrette ingredients and seasoning to taste with kosher salt. Dress the salad and serve immediately. Such gorgeous images and pinned. Glad you had a really nice day and as long as you’re feeling like sleeping in is 645am, that’s all that counts 🙂 Life of a mom, right! Happy Mother’s Day! 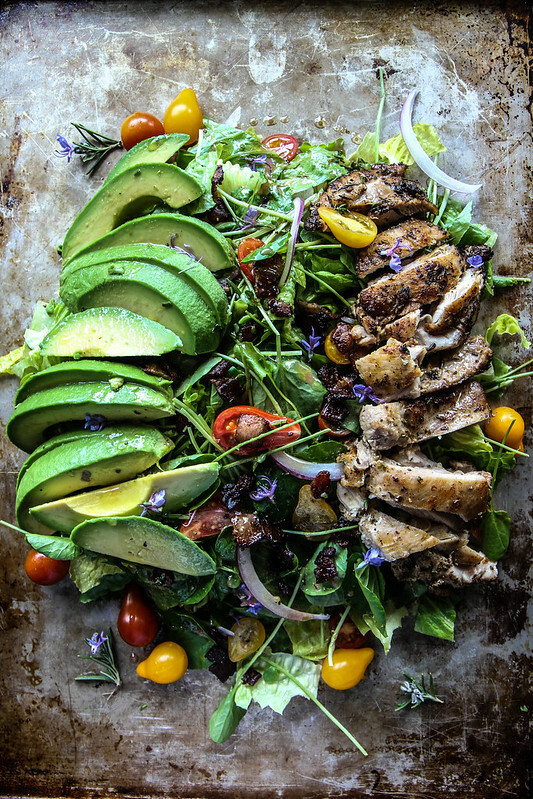 How gorgeous is this salad?! Glad you had a nice Mother’s Day! Thank you Marie!! I hope you did too! May 12, 2014 at 5:38 am	 Corinne B. Great salad. Will have to make soon. I know my family will enjoy this salad on a hot summer day. Thank you Corinne! It is perfect for Summer Dinners- exactly what I want to be eating when it is hot outside. Seriously, sleep for mother’s is the greatest gift of all! I made the crisp with raspberries and blackberries mixed. It turned out really delicious. I’m going to use it as my go to recipe for all future crisps. So easy! I love the coconut flavor from the oil. My only problem is GF flours give me a colossal headache, which is disappointing. Same thing happens to one of my granddaughters. It’s probably the gum thickeners. I’ve noticed I don’t feel that great when I eat bread anymore and whole wheat flour can trigger gout so I think I’m finally ready to admit I just…. might…..be……gluten …..dare I say, sensitive?! Say it ain’t so! Wheat, sugar and eggs basically make up the American diet. You deserve the Nobel Peace Award for taking on this challenge. Vicki- that makes me so happy about the crisp!! I especially love that it worked for all of your family members! There are lots of gluten free flours that do not include the xanthum gum. I will fin rout which ones DONT have it and let you know which ones they are. The more research I do about what is in gluten, the more disturbed I am. I am so excited about this new chapter!!! Your baking sheet looks like mine – well seasoned! Lovely salad. Such a pretty salad! Love the avocado! Now this is one tasty looking salad! I am having some big salad love for your salad! Love the salad dressing too! Shared! I actually said “oh my god” out loud when I read the title of this post. 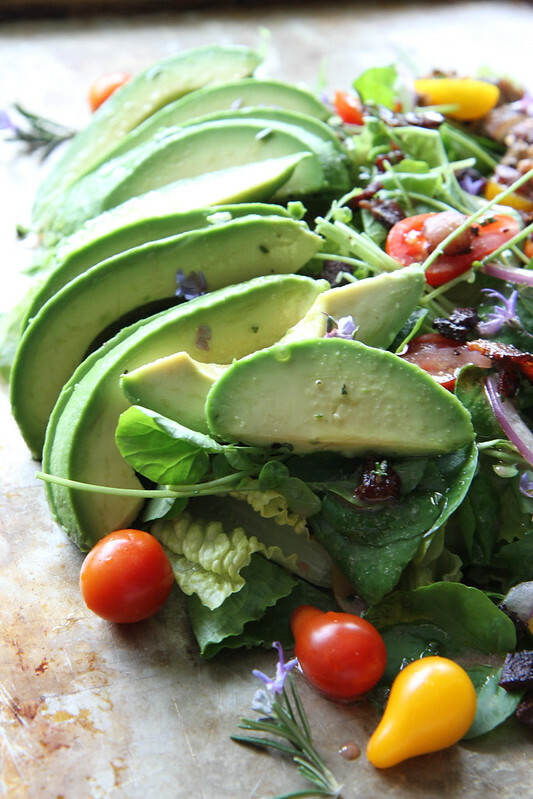 I’m very much into bacon and avocado salads right now. 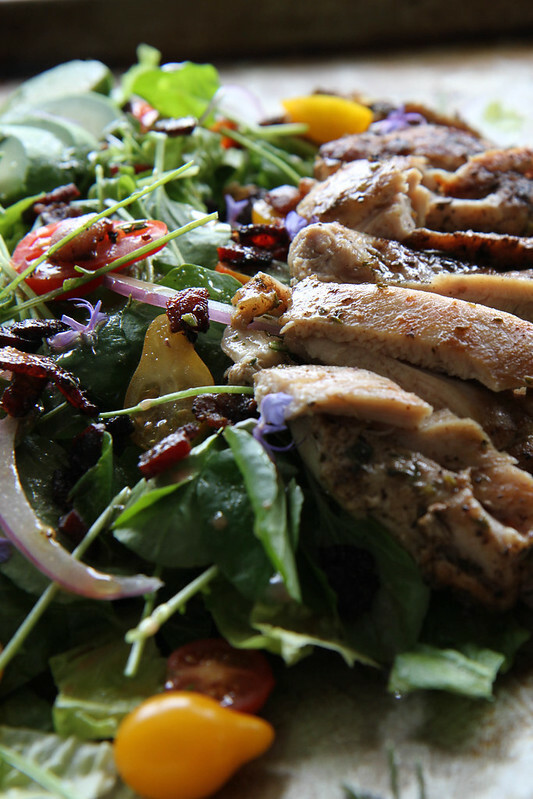 plus, the rosemary chicken…good lord! Oh my. Loving the looks of this salad for breakfast, lunch or dinner. Thank you. Gorgeous! This looks like a really satisfying meal, and I especially love the use of rosemary! Wow, what gorgeous photos. I would love this, I know. This was the first Mother’s Day that I didn’t cook either and I must admit I loved it. This is a perfect salad, at least in my book. I can probably eat it everyday and your photos are simply stunning. Pinned! and delicious looking Salads I can’t wait for my future recipes. This sounds unreal! Loving the flavor combinations here! Can’t wait to give this a try! 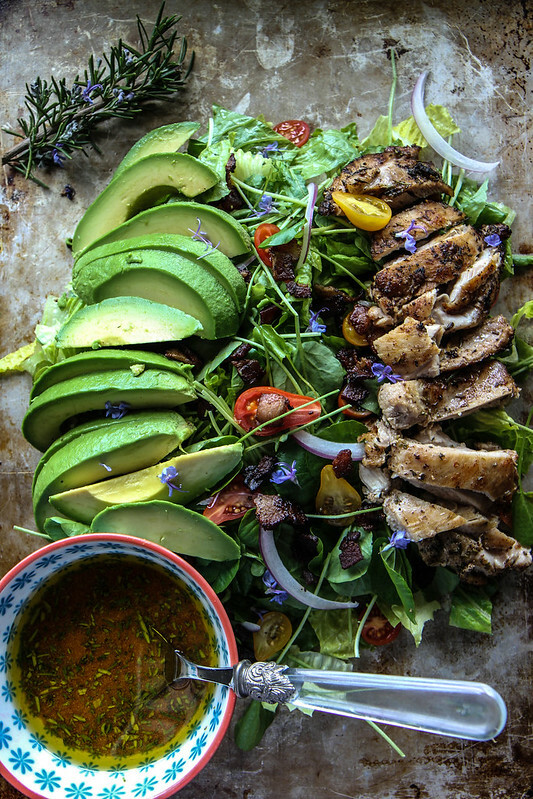 This salad looks absolutely stunning Heather!